Across the globe there are regional, artisanal products with reputations for excellence: Parmigiano Reggiano from Italy, Kobe beef from Japan, and the list goes on. Oregon farmer Aaron Silverman and his partner Mark Cockcroft wanted to do the same for pork in the Northwest. And they’ve accomplished it with Tails & Trotters, producing the first signature Northwest pork. The renowned Jamón Ibérico ham inspired the idea. In Spain, the black-footed or “pata negra” pigs are allowed to roam the oak groves of the region where they are naturally fattened on acorns. And while the Northwest isn’t exactly a great place to grow acorns, Oregon is heaven for hazelnuts. So Aaron and Mark take Washington-raised pigs and finish them on Oregon hazelnuts. The finished product is as good as it gets. Check out the whole article here. 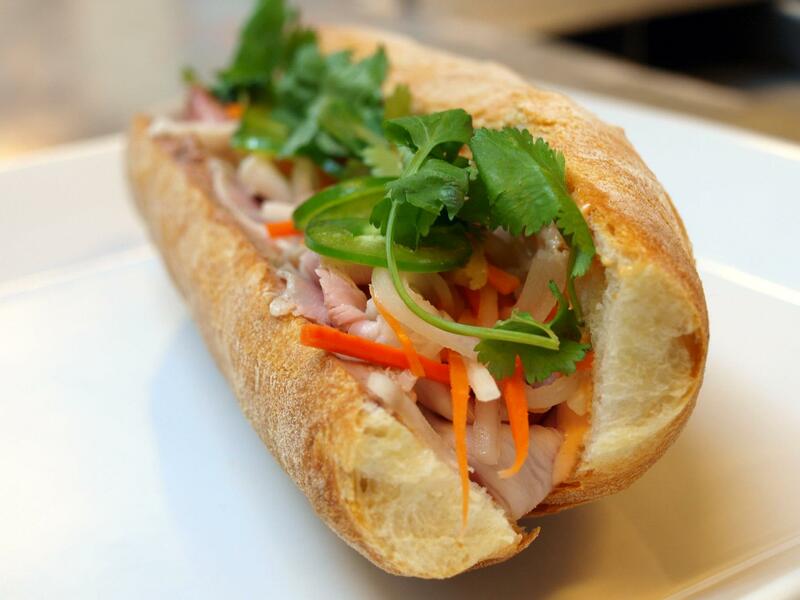 Pictured below is their Bahn Mi – A Vietnamese-style sandwich w/ pickled carrot & daikon, cucumber, jalapeno, cilantro & Asian herb mayo on a fresh bakery roll.